Kieran Hogarth conjured up a dramatic finish to be crowned Lancashire U16 champion. The teenager from Royal Lytham & St Annes Golf Club produced a birdie-birdie finish to edge ahead of the field over 18 holes at Dean Wood GC. And it capped a fantastic fightback from the 15-years-old who had slumped to three over par after the first five holes. Birdies at holes six, seven and nine got him back to level by the turn, before dropped shots at 12, 14 and 16 threatened to de-rail his championship hopes. However Kieran’s final flourish to sign for a 72 turned the tables in dramatic fashion to ease out Southport and Ainsdale’s Matthew Jackman by one shot. “I just tried to stay calm after the first few holes,” said the new champion. “I had played a practice round there, so I knew there would be opportunities to get shots back, particularly on the par fives. “Even on the back nine, I felt I was still in with a chance. I knew that one over had won the championship in the past, so just wanted to get back to that mark. 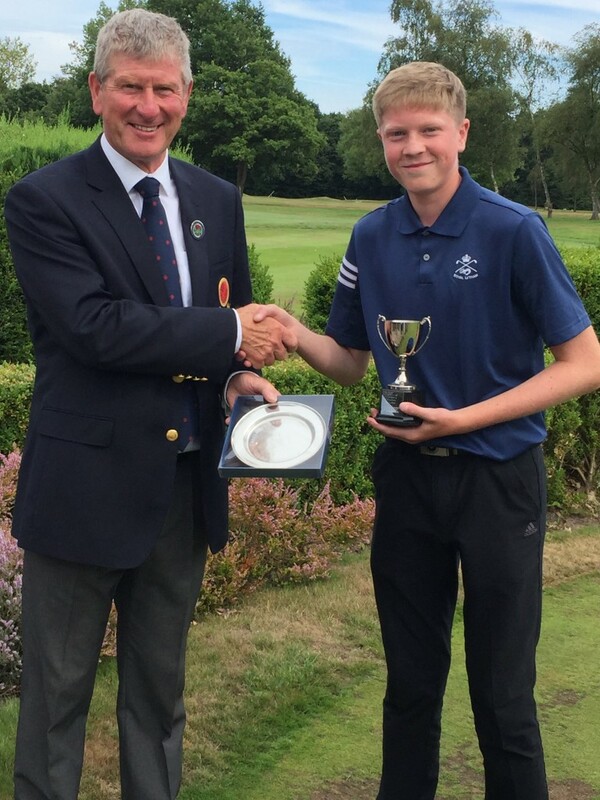 Kieran, who lives in Kirkham, Is a member of the Lancashire Golf Union’s county squad under the guidance of Southport and Ainsdale pro and former European Tour player Jim Payne, having made his debut last year against Yorkshire – the county he has also played against this summer. A pupil at Saint Bede’s Catholic High School in Lytham, Kieran first started playing golf at Myerscough College at the age of six after attending an open day. He continued with weekly lessons there until the age of 11. “I received great coaching from the team there under John Barclay, who continues to be my coach, based at Lancaster Golf Performance Centre at Lancaster Golf Club,” added Kieran, who moved to Royal Lytham in 2014 after playing in a junior match for Myerscough at the Open venue. Starting out with a handicap of 21, he played in competitions and inter-club events, with the coaching team under Ben Squires – and the support of junior organisers Alison Maguire and Dai Mistry – helping cut his handicap by more than half. Kieran continued his development as part of the Lancashire County Academy programme while joining a second club – Fairhaven – to broaden his golfing experience. Now a single handicap golfer, off five, Kieran rates his win at Dean Wood as the highlight of his blossoming career, although he is also part of the three-strong team representing Royal Lytham juniors in the English Junior Club Championships at Frilford Heath in Oxford. Away from the golf course, he plays for both Kirkham Juniors Football Club and Kirkham and Wesham Cricket Club. Added Kieran: “I’m looking forward to continuing my progress with the county golf set-up and would love to play for England one day, but I already owe a debt of thanks to the people who have helped me along the way including John Barclay at Lancaster, all the coaches and organisers at Royal Lytham, Fairhaven and the Lancashire Golf Union.